We previously reported that the stimulation of human blood monocytes with IFN-γ induces the binding of PU.1 to the gp91phox promoter and the consequent expression of gp91phox. In this study, we show that the effect of IFN-γ is reproduced by the serine phosphatase inhibitor, okadaic acid, and this suggests that serine kinases could be involved in gp91phox expression. We also show that IFN-γ induces the serine/threonine phosphorylation of PU.1 in cultured monocytes. This phosphorylation, as well as the IFN-γ-induced PU.1 binding and gp91phox protein synthesis, is slightly affected by the casein kinase II inhibitor, daidzein, but is abrogated by the protein kinase C (PKC) -α and -β inhibitor, Go6976, and by synthetic peptides with sequences based on the endogenous pseudosubstrate region of the classical PKC α and β isoforms. In contrast, peptides reproducing the pseudosubstrate region of PKC ε were without effect. Moreover, we found that the treatment of monocytes with IFN-γ induces the nuclear translocation and the activation of PKC α and βI, but not of PKC βII, and that the IFN-γ-induced phosphorylation of PU.1 was greatly reduced by LY333531, a selective inhibitor of PKC β isoforms. Finally, nuclear run-on assays demonstrated that while the PKC inhibitors, Go6976 and LY333531, decrease the IFN-γ-induced gp91phox transcription, the serine phosphatase inhibitor, okadaic acid, enhances the gp91phox gene transcription. Our results indicate that in cultured monocytes, IFN-γ induces the binding of PU.1 to the gp91phox promoter and the expression of gp91phox by phosphorylation of PU.1 via activation of PKC α and/or βI. The reactive oxygen intermediates involved in the microbicidal and antitumor activities of phagocytes (1, 2) are produced by NADPH oxidase, whose activation requires the association of the cytosolic proteins p67phox, p47phox, and p40phox, and Rac GTP-binding proteins to a membrane-bound cytochrome b558 composed of two subunits, gp91phox and p22phox (3). The mechanisms of activation of the genes encoding the NADPH oxidase are still under investigation. It is known that several transcription factors can regulate the activity of the gp91phox gene promoter. These include CCAAT-displacement protein (4, 5, 6, 7), CCAAT-binding protein-1 (4, 6, 8, 9, 10), YY1 (11), IFN-regulatory factor (IRF)3-1, and IRF-2 (6, 8, 9). However, the most important regulator of the gp91phox gene is PU.1, a DNA-binding protein of the ets family specific for hemopoietic lineages (12, 13, 14, 15), whose consensus sequence (PU box) has been identified at −57 to −50 bp of the gp91phox promoter (16). Its importance is evidenced by the finding that some cases of chronic granulomatous disease (CGD), an inherited condition characterized by a defective NADPH oxidase (3), are due to mutations within the PU box of gp91phox promoter affecting the PU.1 binding and the expression of gp91phox (13, 14, 17, 18). Moreover, neutrophils from PU.1-deficient mice lack both gp91phox and reactive oxygen intermediates production (19). It is worth it to point out that PU.1 also binds the promoters of p47phox and p67phox, and could be involved in the regulation of their expression (20, 21, 22). In myeloid cell lines, PU.1 interacts with IRF-1, IFN consensus sequence binding protein (ICSBP), and CREB binding-protein (CBP) (12, 22) to form the complex hemopoietic-associated factor-1 (HAF-1) (16), which plays an important role in the activation of gp91phox promoter. However, in previous investigations, we did not find an association of PU.1 with IRF-1, ICSBP, or CBP, and we failed to detect a complex corresponding to HAF-1 in mature monocytes (23), suggesting that different mechanisms of gp91phox expression could take place in these cells. We also found that in primary monocytes, the association of PU.1 with gp91phox promoter is increased by cell treatment with IFN-γ (23). The intracellular signaling responsible for this effect remains to be elucidated. In this regard, it is known that PU.1 is phosphorylated in serine/threonine, and this event could regulate its binding to the gene promoters (24), or its association with other transcription factors (25). A few investigations have been performed on the phosphorylation of PU.1 in leukocytes. It has been reported that while the stimulation of U937 leukemic cells with tetradecanoyl-phorbol-13-acetate (TPA) (24) or murine macrophages with TPA, sn-1–2-octanoyl-glycerol, TNF-α, or LPS (26), increases the binding of PU.1 to the DNA via protein kinase C (PKC) activation, the IFN-γ-induced increase of PU.1 binding occurs independently of PKC activity (26). In contrast, in the RAW264.7 murine macrophage cell line, LPS induces the phosphorylation of PU.1 through casein kinase II (CKII) activation, without changes of PU.1 association with DNA (27). Recently, it has been reported that the IFN-γ-induced differentiation of myeloid cell lines is accompanied by tyrosine phosphorylation of IRF-1 and ICSBP, leading to their association with PU.1, formation of HAF-1 and activation of the gp91phox promoter (28). However, it remains to be determined whether IFN-γ signaling induces PU.1 phosphorylation in myeloid cell lines or in monocytes. To our knowledge, no reports are available on PU.1 phosphorylation in human primary monocytes. It is known that the activity of NADPH oxidase, and the expression of some of its components, decrease during the culture of human monocytes (29, 30), and that some molecules reverse this process (30, 31). In a previous paper, we demonstrated that in cultured monocytes, IFN-γ reverses the decrease of gp91phox expression by increasing the binding of PU.1 to the gp91phox promoter (23). In this study, we demonstrate that IFN-γ induces the phosphorylation of PU.1 by activation of PKC α and/or -βI and this leads to association of PU.1 with the gp91phox promoter and to increased gp91phox expression. The inhibitors, okadaic acid (OA), daidzein, and Go6976, were all purchased from Calbiochem (San Diego, CA). Human rIFN-γ was from R&D Systems (Minneapolis, MN). Synthetic myristoylated pseudosubstrate peptides with sequences reproducing the entire endogenous pseudosubstrate regions of various PKC isoforms were a gift from Dr. C. Laudanna (Department of Pathology, University of Verona, Verona, Italy) (32). LY333531 was purchased from Alexis (Lausen, Switzerland). The gp91phox cDNA was subcloned as a 1.8-kb fragment containing the full-length gp91 open reading frame in addition to 3′ and 5′ untranslated sequences. It was subcloned onto BamHI site of the vector pcDNAI/Amp (Life Technologies, Paisley, U.K.). This plasmid and the empty vector were amplified in the Escherichia coli strain, XL1Blue, and were purified with a plasmid Midi kit (Qiagen, Valencia, CA). The pBAE probe for 28 S ribosomal RNA was a kind gift from Dr. M. A. Cassatella (Department of Pathology, University of Verona, Verona, Italy). Blood monocytes were isolated from buffy coats of healthy donors by Ficoll-Hypaque and Percoll (Amersham Pharmacia Biotech, Little Chalfont, U.K.) density gradients, plated in 24-well plates (5 × 105 cells/well/ml) or flasks (2 × 106 cells/ml) in RPMI 1640 with 2 mM l-glutamine, allowed to settle overnight (37°C, 5% CO2), then washed and cultured for various times in medium with 10% heat-inactivated FCS with or without 2 ng/ml IFN-γ and in the presence or absence of phosphatase or kinase inhibitors. Monocytes were cultured for the required times, then the supernatant was removed and substituted with HBSS containing 1 mM di-isopropylfluorophosphate (DFP; Sigma-Aldrich, St. Louis, MO). After 5 min, this solution was discarded, and the cells were lysed with electrophoresis sample buffer (60 mM Tris-HCl, 20% (v/v) glycerol, 4% (w/v) SDS, 2% (v/v) 2-ME, pH 6.8) and boiled for 5 min. Cultured monocytes were scraped in HBSS containing DFP and transferred into precooled tubes before centrifugation (500 × g, 5 min, 4°C). Cell pellets were resuspended in 0.5 ml of ice-cold buffer A (10 mM HEPES, pH 7.9, 10 mM KCl, 1.5 mM MgCl2, 0.5 mM EGTA, 0.5 mM EDTA, 1 mM DTT, 0.5 mM PMSF, 5 μg/ml leupeptin, 5 μg/ml pepstatin, 1 mM sodium-orthovanadate, and 10 μM phenylarsine oxide) containing 0.6% (v/v) Nonidet P-40. After 5 min incubation at 4°C, the samples were centrifuged (800 × g, 10 min, 4°C), and the nuclear pellet was extracted by resuspension in ice cold buffer C (20 mM HEPES, pH 7.9, 0.42 M NaCl, 1.5 mM MgCl2, 1 mM EDTA, 1 mM DTT, 10% (v/v) glycerol, 1 mM PMSF, 5 μg/ml leupeptin, 5 μg/ml pepstatin, 1 mM sodium-orthovanadate, and 10 μM phenylarsine oxide). After 20 min incubation on ice, nuclear extracts were separated by centrifugation (12,000 × g, 4°C, 15 min) and protein concentration was determined. Cell lysates or nuclear extracts were subjected to SDS/PAGE on 12% gels and then transferred to nitrocellulose membranes (Amersham). The blots were then rinsed with TBS-T (50 mM Tris, 170 mM NaCl, 0.2% (v/v) Tween 20, pH 7.5) and incubated for 90 min in TBS-T containing 5% BSA, pH 7.5 (blocking buffer) before incubation overnight (4°C) with 1/500-diluted anti-gp91phox or anti-p40phox rabbit Abs (provided by Dr. A. W. Segal, Department of Medicine, University College, London, U.K.), 1/1000-diluted anti-PU.1 or anti-PKC α, -βI, or -βII rabbit Abs (all from Santa Cruz Biotechnology, Santa Cruz, CA) in TBS-T containing 1 mg/ml BSA. The blots were incubated with HRP-conjugated anti-rabbit IgG (Amersham). Bound Abs were detected by ECL Western blotting detection reagents (Amersham). Nuclear extracts have been prepared as described above. Samples containing equal amounts of proteins were incubated under rotation (4 h at 4°C) with 13 μg of anti-PU.1 Ab conjugated to trisacryl-protein A (Pierce, Rockford, IL). After centrifugation (10 s in Microfuge at full speed), the pellet was washed three times with buffer C, and then boiled for 3 min in 15 μl of electrophoresis sample buffer. The supernatant was subjected to SDS/PAGE on 15% gels and immunoblotted with anti-phosphoserine/threonine (Cell Signaling Technology, Beverly, MA) or anti-PU.1 Ab diluted 1/1000 in TBS-T containing 1 mg/ml BSA. Probe A was constructed by annealing the complementary oligonucleotides spanning positions −65 to −36 of human gp91phox promoter and radiolabeled by T4 polynucleotide kinase using [γ-32P] ATP. EMSA was performed as previously described (23). The gels were dried and exposed to x-ray film. Sequence of probe A (M-Medical Genenco, Firenze, Italy): 5′-CTGTTTTCATTTCCTCATTGGAAGAAGAAG-3′. Nuclei were isolated as described above, directly lysed in electrophoresis sample buffer, and subjected to electrophoresis and immunoblotting with anti-PKC α, βI, βII, anti-CREB, anti-Rac-2 rabbit Abs, or anti-85 kDa α subunit of phosphatidylinositol 3-kinase mouse Ab (all from Santa Cruz Biotechnology) diluted 1/1000 in TBS-T containing 1 mg/ml BSA. The bands recognized by anti-PKC Abs have been subjected to densitometry by Quantity One 4.2.1 (Bio-Rad, Hercules, CA). Whole monocytes or nuclear fractions of monocytes were lysed in radioimmunoprecipitation assay buffer (25 mM Tris, pH 7.5, 150 mM NaCl, 1% Triton X-100, 1% sodium-deoxycholate, 0.1% SDS, 0.5 mM EGTA, 1 mM DTT, 0.5 mM PMSF, 5 μg/ml leupeptin, 5 μg/ml pepstatin, 1 mM sodium-orthovanadate, and 10 μM phenylarsine oxide). The lysates were adjusted to the same protein concentration and incubated for 180 min with 6 μg of anti-PKC α, βI, or βII Abs conjugated to trisacryl-protein A (Pierce, Rockford, IL). Immunocomplexes were collected by centrifugation in microfuge, washed twice with radioimmunoprecipitation assay, and twice with kinase buffer (20 mM Tris-HCl, pH 7.4, 10 mM MgCl2, and 0.5 mM DTT), then resuspended in 20 μl of kinase buffer containing 2 μCi [γ-32P] ATP (specific activity 5000 Ci/mmol; Amersham) and 0.4 mg/ml histone H1 as a substrate (Sigma-Aldrich). After incubation at room temperature for 10 min, the reaction was stopped by the addition of 20 μl of 2-fold concentrated sample buffer, and samples were subjected to electrophoresis on 12% gel and transferred to nitrocellulose as described above. The blots were exposed to X-Omat AR film (Kodak, Rochester, NY). Monocytes (3 × 107cells/assay point) were washed once with HBSS containing DFP, and lysed in ice-cold buffer A containing 0.6% (v/v) Nonidet P-40. After 5 min incubation at 4°C, the samples were centrifuged (800 × g, 10 min, 4°C), and the nuclear pellet was resuspended in 100 μl of ice-cold freezing buffer (50 mM Tris-HCl, pH 8.3, 40% glycerol, 5 mM MgCl2, 0.1 mM EDTA, pH 8.0, and 1 mM DTT) and stored in liquid nitrogen. Thawed nuclei were added to 100 μl of reaction mixture (Tris-HCl, pH 8.0, 10 mM MgCl2, 300 mM KCl, 5 mM DTT, 40 U of RNasin (Life Technologies), 1 mM each of ATP, CTP, and GTP, and 150 μCi of [α-ł2P]UTP (800 Ci mmol−1; Amersham), and incubated at 30°C for 30 min. Newly synthesized RNA was extracted using a commercial kit (SV Total RNA Isolation System; Promega, Madison, WI). Equal amounts (10 μg) of purified, denatured human gp91phox pcDNAI, pBAE probe for 28 S ribosomal RNA, and pcDNAI plasmid (Life Technologies) were vacuum-transferred onto Hybond-N membrane (Amersham) using a Slot Blot apparatus (Schleicher & Schuell, Keene, NH) and subjected to prehybridization at 65°C for 18 h. The precipitated radiolabeled transcripts (∼5 × 106 cpm) were resuspended in 2 ml of hybridization buffer (50% formamide, 4× SSC, 1× Denhardt’s solution, 20 mM sodium phosphate buffer (pH 6.5), and 0.25 mg/ml salmon sperm DNA). Hybridization of radiolabeled transcripts to the membranes was conducted at 65°C for 36 h. Filters were then washed with 3 × 10 min changes of 0.2× SSC at 65°C followed by an incubation at 37 °C in 0.2× SSC with 10 μg/ml RNase A (Life Technologies) for 30 min. Signals were quantified in a phosphorimager before autoradiography for 72 h at −80°C. We previously reported that in nuclear extracts of human cultured monocytes, two complexes composed by PU.1 that we named C2 and C3, associate with a probe (probe A) spanning positions −65 to −36 of the gp91phox promoter and containing the PU box (23). We also found that the binding of PU.1 to this probe, and consequently the expression of the gp91phox protein, decreased during the culture of monocytes, but cell stimulation with IFN-γ reversed these processes (23). We repeated this experiment and in this study, we confirm the results concerning the effect of IFN-γ on PU.1 binding (Fig. 1⇓A) and gp91phox expression (Fig. 1⇓B). Supershift and competition experiments demonstrating that the bands illustrated in Fig. 1⇓A are indeed composed by PU.1 are not shown here because these experiments have already been reported in our previous paper (23). In addition, in this study, we show that cell treatment with OA, a serine phosphatase inhibitor, increased both the PU.1 binding to probe A (Fig. 1⇓A) and gp91phox expression (Fig. 1⇓B). The effect of OA closely resembled that of IFN-γ. The simultaneous treatment of the cells with IFN-γ plus OA did not lead to a further increase of PU.1 binding (Fig. 1⇓A) and gp91phox expression (Fig. 1⇓B). These results suggest that OA reproduces the effect of IFN-γ because serine kinases could be involved in the induction of PU.1 binding and gp91phox expression by IFN-γ. Fig. 1⇓C shows that the nuclear amount of PU.1 remains constant during cell culture in medium alone or upon addition of IFN-γ or OA, demonstrating that the changes of PU.1 binding to DNA observed in Fig. 1⇓A are not linked to a process of synthesis or proteolysis of this transcription factor (see also Ref. 23). Effect of OA on PU.1 binding and gp91phox expression in cultured monocytes. A, EMSA was performed with probe A (see Materials and Methods) using nuclear extracts from monocytes freshly isolated from the blood (fresh monocytes) or cultured for 12 h without (untreated) or with 2 ng/ml IFN-γ, and in the presence or absence of 10 ng/ml OA. The position of C2-C3 complexes composed by PU.1 is indicated by arrows. B, Monocytes were cultured for 48 h in the conditions described in A, then lysed, subjected to electrophoresis, and immunoblotted with anti-gp91phox Ab. Since p40phox expression did not change during culture and was not affected by IFN-γ or OA, the blot has been reprobed with anti-p40phox Ab to demonstrate equal protein loading. C, Aliquots of nuclear extracts used for the experiment described in A have been subjected to electrophoresis, and immunoblotted with anti-PU.1 Ab. The experiments were repeated three times. We then investigated whether IFN-γ is able to induce the phosphorylation of PU.1 in mature monocytes. To this purpose, we immunoprecipitated the PU.1 from nuclear extracts of monocytes treated or untreated with IFN-γ (Fig. 2⇓A). The immunoprecipitated PU.1 was subjected to SDS-PAGE and immunoblotted with an anti-phosphoserine/threonine Ab. The immunoblot was subsequently reprobed with an anti-PU.1 Ab to assess that equal amounts of PU.1 were immunoprecipitated from all the extracts. Fig. 2⇓A shows that in freshly isolated monocytes, PU.1 was phosphorylated in serine/threonine and that its phosphorylation almost disappeared upon cell culture in medium alone. However, the treatment of monocytes with IFN-γ restored the phosphorylation of PU.1 (Fig. 2⇓A). Fig. 2⇓B illustrates that the IFN-γ-induced phosphorylation of PU.1 was clearly detectable at 3 h of stimulation with IFN-γ, maximal at 12 h, and still high at 24 h. In unstimulated cells, the phosphorylation of PU.1 was almost undetectable at these time points (results not shown). IFN-γ stimulation results in increased serine/threonine phosphorylation of PU.1 via PKC activation. A, PU.1 was immunoprecipitated from nuclear extracts of monocytes freshly isolated from the blood (fresh monocytes) or cultured for 12 h in the absence (untreated) or presence of 2 ng/ml IFN-γ. The immunoprecipitates were immunoblotted with anti-phosphoserine/threonine Ab (αphos) and then reprobed with anti-PU.1 Ab (αPU.1). B, PU.1 was immunoprecipitated from nuclear extracts of monocytes cultured for the indicated time points in the presence of IFN-γ and immunoblotted as in A. Point 0 indicates monocytes that have been left to settle overnight in medium alone before stimulation with IFN-γ. A nuclear extract of monocytes was loaded on the same gel and immunoblotted with anti-PU.1 Ab to identify the exact position of PU.1 (αPU.1 blot). C, PU.1 was immunoprecipitated from nuclear extracts of monocytes cultured for 12 h without (untreated) or with 2 ng/ml IFN-γ, in the presence or absence of 200 nm Go6976, 50 μM daidzein, or 50 μM peptides from the pseudosubstrate region of PKC α or ε. The immunoprecipitates were immunoblotted as in A. An aliquot of nuclear extract from IFN-γ-treated monocytes was immunoprecipitated with a rabbit irrelevant Ab as negative control (Ab control). Each experiment was repeated three times. It has previously been reported that in leukemic cell lines and murine macrophages, PU.1 can be phosphorylated by PKC (24, 26) or CKII (27). To understand whether in human monocytes these serine kinases are involved in the IFN-γ-induced phosphorylation of PU.1, we immunoprecipitated PU.1 from cells treated with IFN-γ for 12 h in the presence of specific and well-known inhibitors of PKC or CKII. Fig. 2⇑C shows that the phosphorylation of PU.1 was slightly decreased by cell treatment with the CKII inhibitor, daidzein, and almost abrogated by Go6976, an inhibitor of α and β isoforms of PKC. This finding suggests that in human monocytes, IFN-γ induces the phosphorylation of PU.1 via PKC rather than CKII activation. To further investigate the role of PKC in PU.1 phosphorylation, we took advantage of the ability of synthetic pseudosubstrate peptides, with sequences based on the endogenous PKC pseudosubstrate regions (32), to selectively inhibit the activity of the PKC isoforms expressed in monocytes, e.g., PKC α, βI, βII, ε, δ, and ζ (33). As shown in Fig. 2⇑C, peptides from the pseudosubstrate inhibitory region of PKC α (also recognized by PKC βI and βII, because the sequence of the pseudosubstrate region of PKC α and β isoforms are identical) abrogated the phosphorylation of PU.1 induced by IFN-γ. In contrast, peptides from the pseudosubstrate region of PKC ε did not inhibit PU.1 phosphorylation by IFN-γ (Fig. 2⇑C). Experiments performed with peptides from the pseudosubstrate region of PKC ζ did not lead to consistent results. The doses of the inhibitors used in the experiments shown in Fig. 2⇑C did not affect cell viability as demonstrated by the trypan blue exclusion test (not shown). We then wondered whether the phosphorylation of PU.1 is functional to the association of this transcription factor with gp91phox promoter and to the consequent gp91phox expression (23). To address this problem, we analyzed the effect of the kinase inhibitors affecting PU.1 phosphorylation (Fig. 2⇑C) on PU.1 binding to probe A and gp91phox expression. We found that while the PKC inhibitor, Go6976, caused an abrogation of IFN-γ-induced PU.1 binding to DNA (Fig. 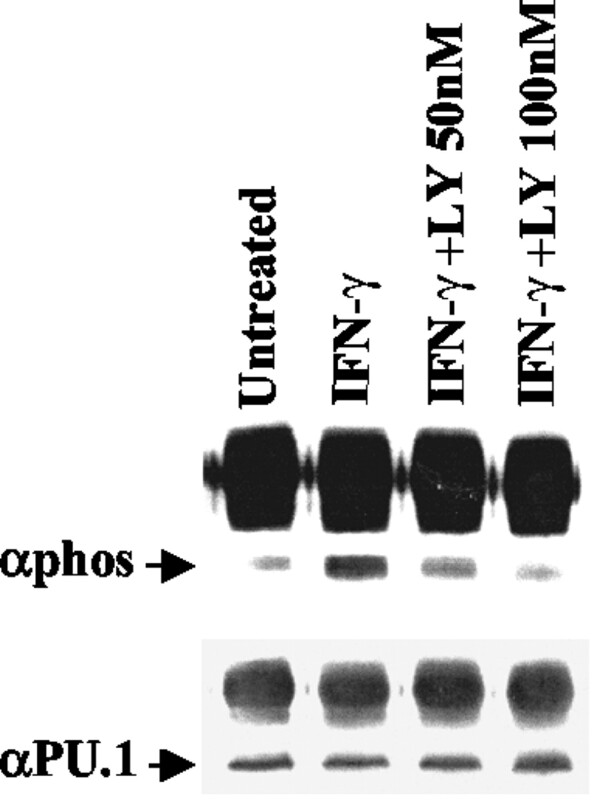 3⇓A), which was accompanied by the abolishment of IFN-γ-induced gp91phox expression (Fig. 3⇓B), the CKII inhibitor, daidzein, only slightly affected the binding of PU.1 (Fig. 3⇓C) and gp91phox expression (Fig. 3⇓D) induced by IFN-γ. The effect of both Go6976 and daidzein on PU.1 binding (Fig. 3⇓, A and C) and gp91phox expression (Fig. 3⇓, B and D) was dose-dependent. We also found that the p42/44 MAP kinase inhibitor, PD098059, did not affect the IFN-γ-induced binding of PU.1 to DNA (data not shown). None of the inhibitors used affected the PU.1 binding and gp91phox expression in monocytes cultured in the absence of IFN-γ (results not shown). The phosphorylation of PU.1 is functional to its association with the gp91phox promoter and gp91phox expression. EMSA was performed with probe A (see Materials and Methods) using nuclear extracts from monocytes cultured for 12 h without or with 2 ng/ml IFN-γ and in the absence or presence of the indicated doses of Go6976 (A), daidzein (C), or 50 μM peptides from the pseudosubstrate region of PKC α or ε (E). The position of PU.1 complexes is indicated by arrows. In parallel, Western blots with anti-gp91phox Ab were performed with lysates of monocytes cultured for 48 h without or with IFN-γ and in absence or presence of the indicated doses of Go6976 (B), daidzein (D), or 50 μM pseudosubstrate peptides of PKC α or ε (F). 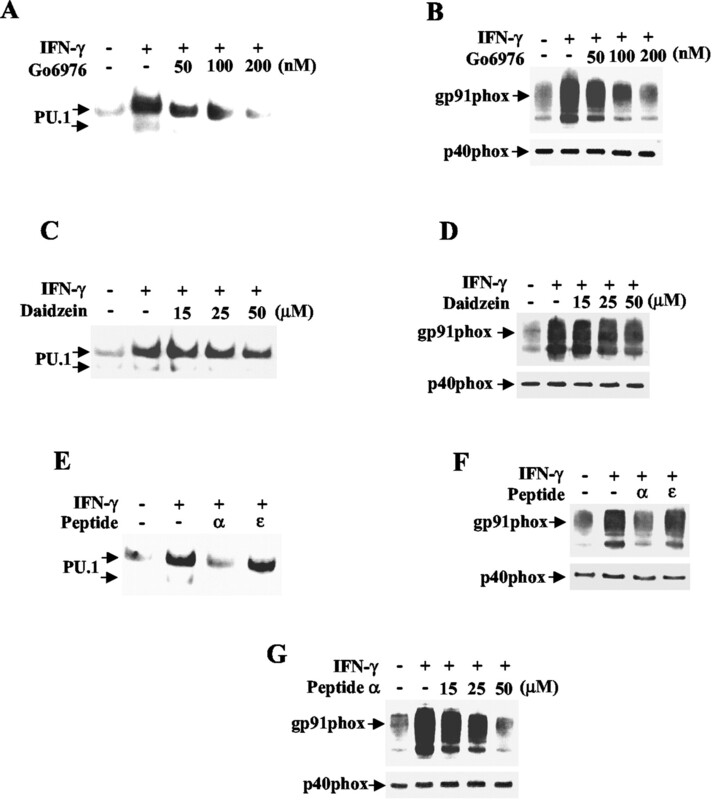 G, Western blot with anti-gp91phox Ab performed with lysates from monocytes cultured for 48 h with or without IFN-γ and the indicated doses of peptides from the pseudosubstrate region of PKC α. Equal protein loading was assessed by reprobing each blot with anti-p40phox Ab. Each experiment has been repeated three times. Additional experiments showed that peptides from the pseudosubstrate region of PKC α (also recognized by PKC βI and βII) selectively eliminated the binding of PU.1 to probe A induced by IFN-γ (Fig. 3⇑E). 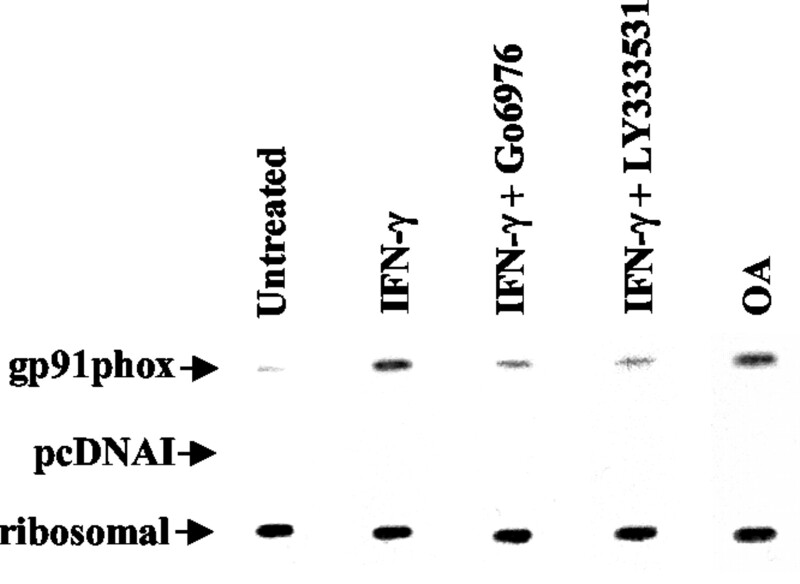 This effect was accompanied by a dose-dependent decrease of IFN-γ-induced gp91phox expression (Fig. 3⇑, F and G). Peptides from the pseudosubstrate region of PKC ε were ineffective on both PU.1 association with probe A (Fig. 3⇑E) and gp91phox expression (Fig. 3⇑F) induced by IFN-γ. All the peptides were without effect on PU.1 binding and gp91phox expression in monocytes cultured in the absence of IFN-γ (results not shown). Translocation of PKC isozymes to different cellular compartments is a hallmark of PKC activation (34). Therefore, to further investigate the involvement of PKC in signaling pathways induced by IFN-γ in human mature monocytes, we evaluated the translocation of this kinase to the nuclei of IFN-γ-stimulated monocytes by Western blot analysis. IFN-γ induced a time-dependent PKC α and βI, but not PKC βII, translocation to the nuclear fraction of cultured monocytes, suggesting that the treatment of these cells with IFN-γ leads to a selective activation of PKC α and βI (Fig. 4⇓A). Although the nuclear protein, CREB, was clearly detectable (Fig. 4⇓A), the cytosolic proteins, Rac-2 and phosphatidylinositol 3-kinase, were not recognized by specific Abs in nuclear fractions used for PKC translocation experiments (results not shown), indicating no cytosolic contamination of nuclear lysates. A quantitative analysis of IFN-γ-induced PKC translocation showed that PKC α and βI translocation was already detectable at 15 min, maximal at 30 min, slightly decreased at 120 min (Table I⇓), and then did not significantly change until 12 h (data not shown). The densitometric analysis reported in Table I⇓ also confirmed that the stimulation of monocytes with IFN-γ did not induce a significant PKC βII translocation. IFN-γ induces the nuclear translocation and the activation of PKC α and βI in human monocytes. A, Monocytes were cultured for the indicated time points with 2 ng/ml IFN-γ, then nuclei were isolated, lysed, subjected to electrophoresis, and immunoblotted with anti-PKC α, βI, or βII Abs. Nuclear lysates from monocytes stimulated with PMA (100 ng/ml, 120 min) were used as positive controls of each PKC isoform translocation (PMA). Since IFN-γ or PMA did not affect the nuclear amount of CREB, the blot was reprobed with anti-CREB Ab to assess equal protein loading (CREB). B, Monocytes were cultured for the indicated time points with IFN-γ, then whole monocyte lysates were subjected to Western blot with anti-PKC α, βI, or βII Abs. C, PKC α, βI, or βII were immunoprecipitated with specific Abs from lysates of whole monocytes cultured for 30 min in the absence (−) or presence (+) of 2 ng/ml IFN-γ. Immunocomplexes were collected and incubated with [γ-32P]ATP and histone H1 as a substrate. Samples were then subjected to electrophoresis and transferred to nitrocellulose. The blots were exposed to x-ray film to visualize histone phosphorylation (Histone). The blots were then probed with anti-PKC α, βI, or βII Abs to assess that equal amounts of each immunoprecipitated PKC isoform had been subjected to the kinase assay (PKC). D, The panel shows an experiment identical with that described under C, with the difference that PKC isoforms were immunoprecipitated from nuclear extracts of monocytes. Each experiment was repeated three times. A Western blot performed with whole lysates of monocytes cultured for various time points (0–12 h) with IFN-γ (Fig. 4⇑B) demonstrates that this cytokine did not increase the expression of PKC α, βI, or βII in these cells. This finding suggests that the increased amount of PKC observed in the nuclear fraction following IFN-γ treatment (Fig. 4⇑A and Table I⇑) is indeed due to PKC translocation rather than to IFN-γ-induced protein synthesis. To further demonstrate that IFN-γ is able to activate PKC in monocytes, we immunoprecipitated PKC α, βI, and βII from lysates of whole human monocytes treated or not with IFN-γ. The enzymatic activity of these kinases was determined by an immunocomplex kinase assay using histone H1 as a substrate. 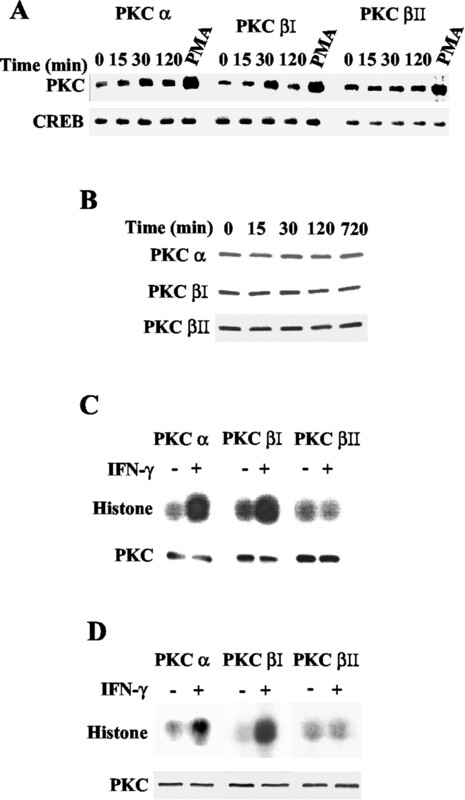 In IFN-γ-treated cells, histone was phosphorylated by PKC α and βI, but not by PKC βII (Fig. 4⇑C). We then investigated the activity of PKC translocated to the nuclei upon IFN-γ treatment. To this purpose, we performed immunocomplex kinase assay experiments with PKC isoforms immunoprecipitated from nuclear fractions of monocytes. We found that in these fractions, PKC α and βI, but not PKC βII, were activated upon IFN-γ-stimulation of monocytes (Fig. 4⇑D). These results demonstrate that the treatment of human monocytes with IFN-γ leads to a selective activation of PKC α and βI, and are consistent with the findings provided by nuclear translocation experiments shown in Fig. 4⇑A and Table I⇑. The results shown in Fig. 4⇑ coupled with the findings obtained with Go6976 and pseudosubstrate peptides, inhibitors of both PKC α and β isoforms, suggest that PKC α and/or βI are involved in PU.1 phosphorylation by IFN-γ. To further investigate the role of PKC in this phosphorylation, we analyzed the effect of LY333531, a selective inhibitor of the PKC β isoforms, on IFN-γ-dependent PU.1 phosphorylation. To this purpose, we immunoprecipitated PU.1 from nuclear extracts of monocytes treated with IFN-γ in the presence or absence of this inhibitor. The phosphorylation of PU.1 was strongly inhibited by cell treatment with LY333531 (Fig. 5⇓). This finding indicates that PKC βI plays an important role in the phosphorylation of PU.1 induced by IFN-γ in human monocytes. Effect of the PKC β inhibitor, LY333531, on IFN-γ-induced phosphorylation of PU.1. The PU.1 was immunoprecipitated from nuclear extracts of monocytes cultured for 12 h with or without (untreated) 2 ng/ml IFN-γ and in the absence or presence of the indicated doses of LY333531 (LY). The immunoprecipitates were immunoblotted with anti-phosphoserine/threonine Ab (αphos) and then reprobed with anti-PU.1 Ab (αPU.1) to assess that equal amounts of PU.1 were immunoprecipitated from all the extracts. The experiment was repeated three times. To further clarify the role of PKC in IFN-γ-induced gp91phox expression, we performed nuclear run-on assays to investigate gp91phox transcription on monocytes incubated with the PKC inhibitors, Go6976 and LY333531, that are able to decrease PU.1 binding/phosphorylation and gp91phox protein synthesis (Figs. 2⇑, 3⇑, and 5⇑). In unstimulated monocytes (Fig. 6⇓), there was little basal transcriptional activity, but IFN-γ augmented gp91phox gene transcription. A quantitative analysis of the signals showed that IFN-γ increased gp91phox gene transcription by 16-fold. Fig. 6⇓ also shows that cell treatment with the PKC α and β inhibitors, Go6976 and LY333531, decreased the IFN-γ-induced gp91phox transcription (mean inhibition: 78 and 60% respectively). These results demonstrate that PKC α and β are involved in activation of gp91phox gene transcription by IFN-γ, reasonably via PU.1 phosphorylation. Moreover, we found that the phosphatase inhibitor, OA, increased gp91phox transcription by 15-fold, an effect that was similar to that of IFN-γ (Fig. 6⇓). This result further indicates the relevance of serine kinases in activation of gp91phox gene. PKC α and β inhibitors decrease gp91phox gene transcription. Monocytes were cultured for 24 h with or without (untreated) 20 ng/ml IFN-γ, in the presence or absence of 200 nM Go6976, 100 nM LY333531, or 10 ng/ml OA. Then nuclei were isolated and nuclear run-on assays were performed with gp91phox pcDNAI as described under Materials and Methods. The pcDNAI vector and pBAE probe for 28 S ribosomal RNA served as internal controls for nonspecific binding and standardization, respectively. The data are representative of two separate experiments. In this paper, we demonstrate for the first time that IFN-γ induces the serine/threonine phosphorylation of PU.1 in human monocytes. It has been reported that this phosphorylation could mediate the binding of PU.1 to DNA (24, 26) or its association with other transcriptional regulators (25). In this study, we show that in mature monocytes, the phosphorylation of PU.1 is functional to the association of this transcription factor with the PU box of the gp91phox promoter. In fact, the treatment of the cells with IFN-γ, or with the serine phosphatase inhibitor, OA, increased the binding of PU.1 to a probe reproducing the PU box of the gp91phox promoter, and PU.1 binding was decreased by serine kinase inhibitors. However, we cannot exclude that the phosphorylation of PU.1 could be also involved in the interaction of PU.1 with other transcription factors. We previously failed to identify the proteins that could interact with PU.1 in nuclei of mature monocytes (23), and therefore, a characterization of such molecules is required to clarify this point. Experiments addressing this problem are underway in our laboratory. In this paper, we also show that in monocytes, IFN-γ induces the phosphorylation of PU.1 essentially through the activation of PKC, while CKII plays a less important role in this phosphorylation. It is known that in TPA-stimulated U937 cells (24), and in murine macrophages treated with TPA, sn-1–2-octanoyl-glycerol, LPS, or TNF-α (26), PU.1 is phosphorylated by PKC. Other authors report that in the RAW264.7 murine macrophage cell line, LPS can stimulate CKII activity and PU.1 phosphorylation (27). However, to our knowledge, this is the first demonstration that in human mature monocytes, PU.1 is phosphorylated via activation of PKC and, to a lesser extent, CKII. It is worth it to point out that contrasting results have been shown regarding the ability of IFN-γ to activate PKC (26, 35, 36). In this study, we demonstrate that in cultured monocytes, IFN-γ induces the nuclear translocation and activation of PKC α and βI, but not PKC βII. This finding indicates that IFN-γ indeed activates PKC α and βI isoforms, and that these isoforms, on the basis of the results obtained with the protein kinase inhibitor, Go6976, and pseudosubstrate peptides could be involved in the phosphorylation of PU.1. However, these inhibitors do not discriminate between PKC α and β isoforms. Therefore, we also analyzed the effect of LY333531, a specific inhibitor of PKC β isoforms, on PU.1 phosphorylation, and we found that LY333531 strongly reduced the IFN-γ-induced phosphorylation of PU.1. This result suggests that PKC βI plays an important and perhaps predominant role in PU.1 phosphorylation by IFN-γ, but it does not excludes a contribution of PKC α to this phosphorylation. Therefore, additional experiments are required to elucidate whether PKC α also has a role in PU.1 phosphorylation. Finally, in this study, we report that the changes of PU.1 phosphorylation and, consequently, of its binding to the gp91phox promoter are paralleled by changes of gp91phox protein synthesis in monocytes. Moreover, we found that while PKC inhibitors, able to reduce the phosphorylation/binding of PU.1, decrease the IFN-γ-induced gp91phox transcription, serine phosphatase inhibition enhances gp91phox transcription. These findings corroborate the previous reports from our (23) and other (12, 13, 14, 15, 16, 17, 18, 19) laboratories demonstrating that the association of PU.1 with the gp91phox promoter is an essential mechanism for the regulation of gp91phox expression, and suggest that the phosphorylation of PU.1 is a key event in the induction of gp91phox expression by IFN-γ in human monocytes. It is worth it to point out that it has been recently reported that in myeloid cell lines, differentiation-dependent up-regulation of p47phox gene transcription is associated with changes in PU.1 phosphorylation and increased PU.1 binding affinity (37). Therefore, PU.1 phosphorylation could play an important role in the expression of both gp91phox and p47phox NADPH oxidase components. ↵1 This work was supported by grants from Fondazione Cassa di Risparmio di Verona (Progetto Sanità 1996–97 and Bando 2001). ↵3 Abbreviations used in this paper: IRF, IFN-regulatory factor; CGD, chronic granulomatous disease; ICSBP, IFN consensus sequence binding protein; CBP, CREB binding protein; HAF-1, hemopoietic-associated factor-1; TPA, tetradecanoyl-phorbol-13-acetate; PKC: protein kinase C; CKII, casein kinase II; OA, okadaic acid; DFP, di-isopropylfluorophosphate. Johnston, R. B.. 1988. Monocytes and macrophages. N. Engl. J. Med. 12:747. Nathan, C., Z. A. Cohn. 1980. Role of oxygen dependent mechanisms in antibody-induced lysis of tumor cells by activated macrophages. J. Exp. Med. 152:198. Segal, B. H., T. L. Leto, J. I. Gallin, H. L. Malech, S. M. Holland. 2000. Genetic, biochemical, and clinical features of chronic granulomatous disease. Medicine 79:170. Skalnik, D. G., E. C. Strauss, S. H. Orkin. 1991. CCAAT displacement protein as a repressor of the myelomonocytic-specific gp91phox gene promoter. J. Biol. Chem. 266:16736. Lievens, P. M., J. J. Donady, C. Tufarelli, E. J. Neufeld. 1995. Repressor activity of CCAAT displacement protein in HL60 myeloid leukemia cells. J. Biol. Chem. 270:12745. Luo, W., D. G. Skalnik. 1996. CCAAT displacement protein competes with multiple transcriptional activators for binding to four sites in the proximal gp91phox promoter. J. Biol. Chem. 271:18203. Catt, D., S. Hawkins, A. Roman, W. Luo, D. G. Skalnik. 1999. Overexpression of CCAAT displacement protein represses the promiscuously active proximal gp91phox promoter. Blood 94:3151. Eklund, E. A., W. Luo, D. G. Skalnik. 1996. Characterization of three promoter elements and cognate DNA binding proteins necessary for IFN-γ induction of gp91phox transcription. J. Immunol. 157:2418. Luo, W., D. G. Skalnik. 1996. Interferon regulatory factor-2 directs transcription from the gp91phox promoter. J. Biol. Chem. 271:23445. Eklund, E. A., R. Kakar. 1997. Identification and characterization of TF1phox, a DNA-binding protein that increases expression of gp91phox in PLB985 myeloid leukemia cell. J. Biol. Chem. 272:9344. Jacobsen, B. M., D. G. Skalnik. 1999. YY1 binds five cis-elements and trans-activates the myeloid cell-restricted gp91phox promoter. J. Biol. Chem. 274:29984. Eklund, E. A., A. Jalava, R. Kakar. 1998. PU.1, interferon-regulatory factor-1, and interferon consensus sequence binding protein cooperate to increase gp91phox expression. J. Biol. Chem. 273:13957. Voo, K. S., D. G. Skalnik. 1999. Elf-1 and PU.1 induce expression of gp91phox via a promoter element mutated in a subset of chronic granulomatous disease patients. Blood 93:3512. Suzuki, S., A. Kumatori, I. A. Haagen, Y. Fujii, M. A. Sadat, H. L. Jun, Y. Tsuji, D. Roos, M. Nakamura. 1998. PU.1 as an essential activator for the expression of gp91phox gene in human peripheral neutrophils, monocytes and B lymphocytes. Proc. Natl. Acad. Sci. USA 95:6085. Klemsz, M. J., S. R. McKercher, A. Celada, C. Van Beveren, R. A. Maki. 1990. The macrophage and B cell-specific transcription factor PU.1 is related to the ets oncogene. Cell 61:113. Eklund, E. A., D. G. Skalnik. 1995. Characterization of a gp91phox promoter element that is required for interferon-γ-induced transcription. J. Biol. Chem. 270:8267. Newburger, P. E., D. G. Skalnik, P. J. Hopkins, E. A. Eklund, J. T. Curnutte. 1994. Mutations in the promoter of the gene for gp91phox in X-linked chronic granulomatous disease with decreased expression of cytochrome b558. J. Clin. Invest. 94:1205. Woodman, R. C., P. E. Newburger, A. P. Erickson, J. Rae, M. S. Cohen, J. T. Curnutte. 1995. A new X-linked variant of chronic granulomatous disease characterized by the existence of a normal clone of respiratory burst-competent phagocytic cells. Blood 85:231. Anderson, K. L., K. A. Smith, F. Pio, B. E. Torbett, R. A. Maki. 1998. Neutrophils deficient in PU.1 do not terminally differentiate or become functionally competent. Blood 92:1576. Li, S. L., A. J. Valente, S. J. Zhao, R. A. Clark. 1997. PU.1 is essential for p47phox promoter activity in myeloid cells. J. Biol. Chem. 272:17802. Li, S. L., W. Schlegel, A. J. Valente, R. A. Clark. 1999. Critical flanking sequences of PU.1 binding sites in myeloid-specific promoters. J. Biol. Chem. 274:32453. Eklund, E. A., R. Kakar. 1999. Recruitment of CREB-binding protein by PU.1, IFN-regulatory factor-1, and the IFN consensus sequence-binding protein is necessary for IFN-γ-induced p67phox and gp91phox expression. J. Immunol. 163:6095. Dusi, S., M. Donini, D. Lissandrini, P. Mazzi, V. Della Bianca, F. Rossi. 2001. Mechanisms of expression of NADPH oxidase components in human cultured monocytes: role of cytokines and transcriptional regulators involved. Eur. J. Immunol. 31:929. Carey, J. O., K. J. Posekany, J. E. deVente, G. R. Pettit, D. K. Ways. 1996. Phorbol ester-stimulated phosphorylation of PU.1: association with leukemic cell growth inhibition. Blood 87:4316. Marecki, S., M. J. Fenton. 2000. PU.1/interferon-regulatory factor interactions. Cell Biochem. Biophys. 33:127. Xue, Y., P. Alford, R. E. Shackelford. 1999. Protein kinase C activation increases binding of transcription factor PU.1 in murine tissue macrophages. Biochem. Biophys. Res. Commun. 254:211. Lodie, T. A., R. Savedra, D. T. Golenbock, C. P. Van Beveren, R. A. Maki, M. J. Fenton. 1997. Stimulation of macrophages by lipopolysaccharide alters the phosphorylation state, conformation and function of PU.1 via activation of casein kinase II. J. Immunol. 168:1848. Kautz, B., R. Kakar, E. David, E. A. Eklund. 2001. SHP1 protein tyrosine phosphatase inhibits gp91phox and p67phox expression by inhibiting interaction of PU.1, IRF1, ICSBP, and CBP with homologous cis elements in the CYBB and NCF2 genes. J. Biol. Chem. 276:37868. Nakagawara, A., C. F. Nathan, Z. A. Cohn. 1981. Hydrogen peroxide metabolism in human monocytes during differentiation in vitro. J. Clin. Invest. 68:1243. Levy, R., H. L. Malech. 1991. Effect of 1,25-dihydroxyvitamin D3, lipopolysaccharide, or lipoteichoic acid on the expression of NADPH oxidase components in cultured human monocytes. J. Immunol. 147:1066. Berry, S. D., S. W. Edwards. 1996. Preservation of the activity of NADPH oxidase in human monocyte/macrophages. Biochem. Soc. Trans. 24:490S. Laudanna, C., D. Mochly-Rosen, T. Liron, G. Constantin, E. C. Butcher. 1998. Evidence of ζ protein kinase C involvement in polymorphonuclear neutrophil integrin-dependent adhesion and chemotaxis. J. Biol. Chem. 273:30306. Li, Q., V. Subbulakshmi, A. P. Fields, N. R. Murray, M. K. Cathcart. 1999. Protein kinase Cα regulates human monocytes O−2 production and low density lipoprotein lipid oxydation. J. Biol. Chem. 274:3764. Mochly-Rosen, D.. 1995. Localization of protein kinases by anchoring proteins: a theme in signal transduction. Science 268:247. Hamilton, T. A., D. L. Becton, S. D. Somers, P. W. Gray, D. O. Adams. 1985. Interferon-γ modulates protein kinase C in murine peritoneal macrophages. J. Biol. Chem. 260:1378. Visnjic, D., D. Batinic, H. Banfic. 1997. Arachidonic acid mediates interferon-γ-induced sphingomyelin hydrolysis and monocytic marker expression in HL-60 cell line. Blood 89:81. Marden, C. M., D. Stefanidis, D. S. Cunninghame-Graham, C. M. Casimir. 2003. Differentiation-dependent up-regulation of p47phox gene transcription is associated with changes in PU.1 phosphorylation and increased binding affinity. Biochem. Biophys. Res. Commun. 305:193.